HOw do I put these Lashes on?!? First of all if you can put on eyeliner you can put these on. So, that should at least give you a little comfort. It is easier than you think and practice makes perfect. Usually after a few tries most are comfortable. 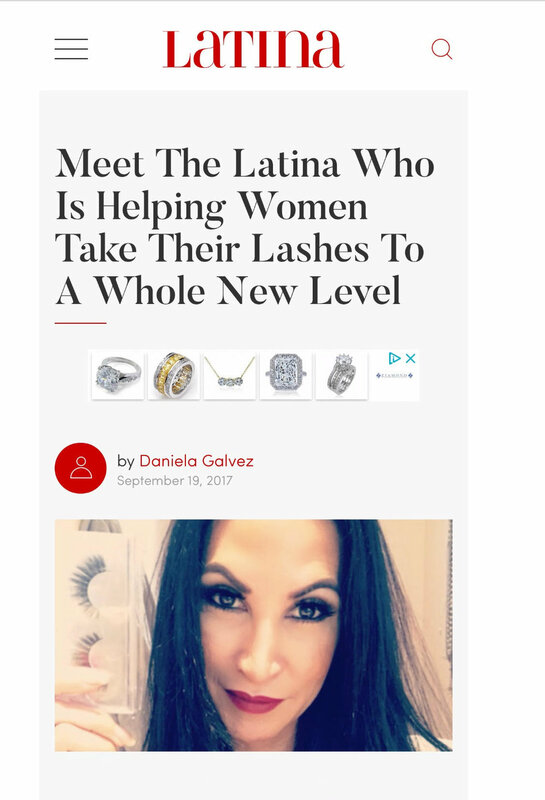 If you have had a bad experience I'm guessing you may have used lower quality lashes and didn't let your glue "set"...LETS GET STARTED! Trim your lashes from the inner corner with sharp scissors and then clip the tail off the outer end. Put the glue on. I like latex glue because it moves with the eye. If you have an allergy then get a "latex free" glue and test it on your arm first. REMEMBER a little goes a long way. Basically you are just putting a line of glue on the band of the lashes. WAIT. Let the glue set for 60 to 90 seconds or until it gets tacky. Using the applicator or tweezers or your fingers start at the outer corner and press it into your lash line where you would "top line" your eye. Work your way towards the center. Try not to flutter your eyes too much while the lash is setting or for about 30 seconds. THAT IS IT! YAY! YOU DID IT! I like to add al layer of liner along the top of the lashes so they blend with y makeup but the possibilities are endless!